“Skyscraper” would be fun if it had a solid agenda. The story is sketchy at best. Dwayne Johnson did what he could with what he was given. 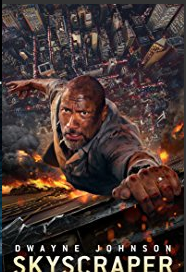 The best elements of the movie are the cinematography, Dwayne Johnson and “The Skyscraper”, a beautifully built 200+ floor building. “Skyscraper” is best viewed on cable, DVD or Blue Ray.